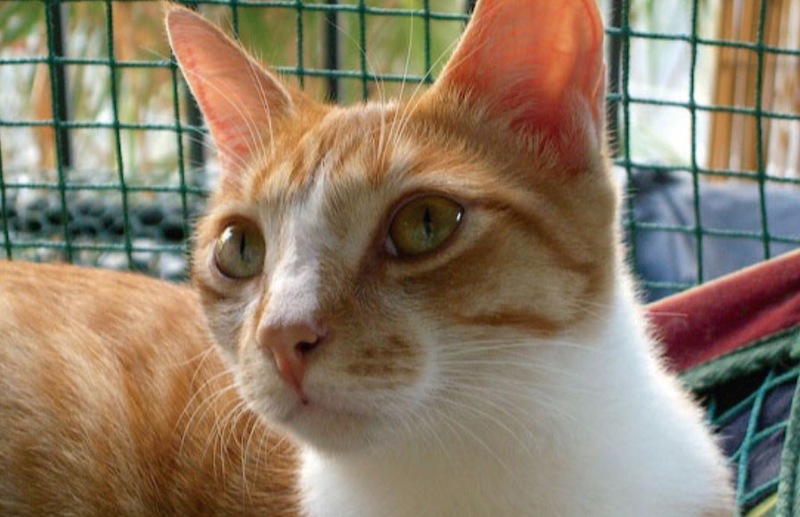 Whether you live in a condominium or a community with a homeowner’s association (HOA), getting approval to build a catio on your property can be difficult. HOA rules are notoriously strict and associations typically deny requests to build outdoor cat enclosures. So what are your options? This is the place to start because your HOA may, in fact, allow catios or something similar. If they do, follow the rules precisely – dot your i’s and cross your t’s – so the association has no reason to come after you later. Then build your catio, call it a day, and consider yourself (and your feline family) lucky! This is the approach I took while living in a high-rise building more than a decade ago. And it took the building a few years to even notice the six foot tall catio on my eighth floor balcony. The condominium rules stated that no structures were permitted on balconies that could be seen from the street. My solution was to turn the enclosure on its side, making it invisible from the boulevard below, and thereby compliant. It wasn’t ideal, as the built-in shelves were no longer usable, but my cats continued to enjoy it daily. Generally this approach works better for homes than condominiums as it’s easier to hide construction and the final enclosure. Building management and nosey neighbors are likely to notice a bunch of workers crisscrossing the lobby with 4″x4″s and wire mesh. The structure in the back yard was erected late last year as a screened area for use by pets, or “catio” (a patio for cats). Its dimensions are 2.5′ deep x 4.5′ wide x 9.5′ tall. Its base, made of paver bricks, is an extension of the existing concrete patio and the structure is hidden from front street view, tucked behind the back chimney. The wooden frame was treated with a natural oil-based stain to protect it from water, prevent rotting, and limit the cats’ exposure to toxic chemicals that are present in regular paint. -The structure is exclusively for the environmental enrichment of our pet cats, analogous to a dog house or dog run. IN compliance with the “Dog Houses/Dog Runs” section, the structure is hidden from front street view. Please note that if CME finds that the reasoning set forth by the language in its own cited documentation is insufficient to rescind this violation and void and associated fines, it’s decision will continue to appealed. Additionally, further documentation will be requested in order to determine the exact manner in which “the alleged incident” materially affects the safety, livability, or quiet enjoyment of the neighborhood. These steps will be taken in keeping with our commitment to building a welcoming and engaged local community that is guided by values of fairness and inclusion. Such a great letter! Keep the tone polite, the evidence factual, and appeal to the common good. But also make it known that you will fight the HOA tooth and nail and, perhaps, hire a lawyer. HOAs hate to spend money or engage in protracted legal battles. Oftentimes association rules will allow for the construction of patios, decks, and the like. In this case, build an enclosed patio, maybe use screens instead of mesh, throw in a couple chairs and/or a couch and voila, your cats can enjoy your brand new “patio” with you. No one but you and the kitties will be any the wiser! While this is certainly the most difficult route, pet owners have the facts and common sense on their side. Note the massive environmental benefits to restricting cats from roaming freely. Saving birds and other wildlife is sure to appeal your environmental inclined neighbors. In HOA communities, neighbors will also prefer catios to cats jumping into their yard, spraying, going to the bathroom, and killing birds and other animals on their property. With 75 million cats living in one-third of all American homes, you are sure to find allies among your feline owning neighbors and HOA board members. Comfort animals are usually cats or dogs that provide emotional support or a therapeutic benefit to their owner. For practical purposes they are treated like service animals that are trained to perform tasks that benefit someone with a disability, like a seeing-eye dog. The federal Fair Housing Act (FHA) mandates that HOAs provide “reasonable accommodations” to homeowners who suffer from physical or emotional disabilities or have a related need for comfort. In other words, with a note from a doctor, an HOA must allow a cat who provides emotional assistance to its human parent in a building that has a policy against pets. Essentially, the laws regarding emotional support animals override any HOAs rules and regulations. However, emotional support animals are not allowed to do whatever they want. While HOAs cannot infringe upon the rights of the individual pet owner, they also must not upset the community. Thus, building a catio likely falls in a gray area which could potentially be negotiated. Every situation is different and cat owners should carefully consider the above to determine the best way forward.